New Jersey was one of the first states to pass a law (P.L. 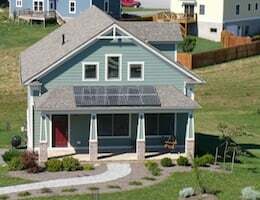 2007, c. 153) that protects homeowners’ right to go solar from HOA interference. The law is clear that your community association cannot completely deny your ability to install a solar system. The law states, “An association formed for the management of commonly-owned elements and facilities, regardless of whether organized pursuant to section 1 of P.L.1993, c.30 (C.45:22A-43), shall not adopt or enforce a restriction, covenant, bylaw, rule or regulation prohibiting the installation of solar collectors on certain roofs of dwelling units”. The law applies to any entity that manages or maintains common elements and/or facilities of a community. Homeowners should review their own governing documents to understand what exact ownership rights apply in their specific setting before proceeding to go solar. Governing documents must be provided at closing. They can also usually be obtained through association management. The law would likely not apply to individuals living in a condominium or co-op arrangement, where the roof is a common element and not “owned” by individual unit owners. While the association or management may not prohibit installation, they can enforce reasonable restrictions in several areas. These are: qualifications, certification and insurance requirements of installers; location where solar collectors may be placed on roofs; concealment of solar collectors’ supportive structures, fixtures and piping; color harmonization of solar collectors with the colors of structures or landscaping in the development; and aggregate size or coverage or total number of solar collectors. None of these restrictions, taken separately or together, can increase the cost of installation by more than 10 percent. Associations cannot enforce a rule or rules that would inhibit a system from operating at its maximum capacity. An example of this would be a requirement that solar systems be installed on the backyard-facing side of the roof, if that roof faces directly due north. You should contact your association management early in the process if you are interested in going solar. Your association may require you to go through a review before the association board or its agent before permission is granted to install your system. Association review and approval is quite commonplace. If after such a review, you believe that any provision of this law has not been adhered to, homeowners can contact the Association Regulation Unit in the New Jersey Department of Community Affairs for guidance.